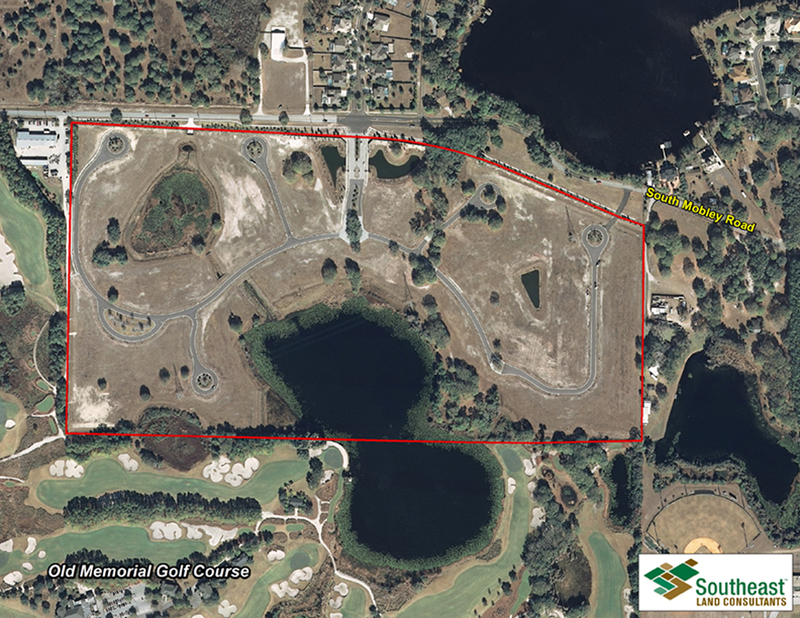 TAMPA, Fla. (Sept. 24, 2014) — Following a few starts and stops since the project first began in 2008, Tampa’s 80-acre Old Memorial residential community, contiguous to the Old Memorial Golf and Country Club, is finally moving steadily toward completion. Last week, Old Memorial Club, Inc. sold the remaining five lots in the master-planned community, located on the south side of Mobley Road approximately a half-mile west of Gunn Highway. Taylor Morrison purchased the lots for $1,034,000. The transaction completes Taylor Morrison and David Weekly Homes’ acquisition of all 92 lots in the community over the past year-and-a-half at a combined purchase price of $10.3 million. David Berner and Bill Short, CCIM, of Southeast Land Consultants, Inc. and Ed Andrews with Terra Management Group, Inc. represented the seller in all three transactions. The homes in this Taylor Morrison/David Weekly Homes project start around $500,000 for interior lots and $1 million for lakefront lots. The community is halfway built out and homes are currently being sold. “Numerous homebuilders are looking for good infill opportunities right now, especially in the $400,000 to $600,000 range, which provides good profit margins on home sales,” said Berner. In 2007, the Old Memorial gated lakefront community was initially designed for 51 large estate lots averaging from .75 to 1 acre in size. The plan was to target affluent buyers interested in building custom homes ranging in price from $800,000 on interior lots to $2 million on lakefront lots. Construction delays and the recession stalled progress. “The economy took a turn for the worst around that time and there was no longer a market for that kind of buyer,” said Short. By the end of 2012, with only one lot having been purchased in the community, the seller engaged SLC to conduct a comprehensive market analysis to determine what product mix would best align with buyer demand. SLC advised a redesign of the community that would reduce the lot sizes and increase the lot density from 51 lots to 92 lots. This would also require tearing up streets to relocate the sewer and water laterals for the smaller-lot design. Terra Management Group, Inc. was hired to oversee the construction. “The redesign was costly to do, but it paid off in a big way,” said Berner. After the community redesign, SLC took the property to market, and within two weeks received eight offers from national and regional homebuilders to buy all lots in the community. Southeast Land Consultants is an innovative land brokerage and consulting firm with more than 25 years of sales and transactional experience. We combine in-depth market knowledge, cutting-edge mapping technology, and an extensive network of relationships throughout Florida and the Southeast to provide an integrated suite of services. We are uniquely qualified to deliver consistently superior results to a select group of clients.